For the Canadian politician, see Paul Langevin (politician). 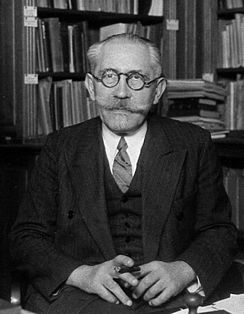 Paul Langevin ForMemRS (/lænʒˈveɪn/; French: [pɔl lɑ̃ʒvɛ̃]; 23 January 1872 – 19 December 1946) was a French physicist who developed Langevin dynamics and the Langevin equation. He was one of the founders of the Comité de vigilance des intellectuels antifascistes, an antifascist organization created in the wake of the 6 February 1934 far right riots. Langevin was also president of the Human Rights League (LDH) from 1944 to 1946 – he had just recently joined the French Communist Party. Being a public opponent against fascism in the 1930s resulted in his arrest and consequently he was held under house arrest by the Vichy government for most of the war. Previously a doctoral student of Pierre Curie and later a lover of Marie Curie, he is also famous for his two US patents with Constantin Chilowsky in 1916 and 1917 involving ultrasonic submarine detection. He is entombed at the Panthéon. Langevin was born in Paris, and studied at the École de Physique et Chimie and the École Normale Supérieure. He then went to Cambridge University and studied in the Cavendish Laboratory under Sir J. J. Thomson. Langevin returned to the Sorbonne and obtained his Ph.D. from Pierre Curie in 1902. In 1904, he became professor of physics at the Collège de France. In 1926, he became director of the École de Physique et Chimie (later became École supérieure de physique et de chimie industrielles de la Ville de Paris, ESPCI ParisTech), where he had been educated. He was elected in 1934 to the Académie des sciences. Langevin is noted for his work on paramagnetism and diamagnetism, and devised the modern interpretation of this phenomenon in terms of spins of electrons within atoms. His most famous work was in the use of ultrasound using Pierre Curie's piezoelectric effect. During World War I, he began working on the use of these sounds to detect submarines through echo location. However the war was over by the time it was operational. During his career, Paul Langevin also spread the theory of relativity in academic circles in France and created what is now called the twin paradox. In 1898, he married Emma Jeanne Desfosses, with whom he had four children, Jean, André, Madeleine and Hélène. In 1910, he reportedly had an affair with the then-widowed Marie Curie; some decades later, their respective grandchildren, grandson Michel Langevin and granddaughter Hélène Langevin-Joliot got married to one another. He was also noted for being an outspoken opponent of Nazism, and was removed from his post by the Vichy government following the occupation of the country by Nazi Germany. He was later restored to his position in 1944. He died in Paris in 1946, two years after living to see the Liberation of Paris. He is buried near several other prominent French scientists in the Pantheon in Paris. In 1933, he had a son, Paul-Gilbert Langevin, with physicist Eliane Montel (1898-1992). Their son became later a renowned musicologist. His daughter, Hélène Solomon-Langevin, was arrested for Resistance activity and survived several concentration camps. She was on the same convoy of female political prisoners as Marie-Claude Vaillant-Couturier and Charlotte Delbo. In 1916 and 1917, Paul Langevin and Chilowsky filed two US patents disclosing the first ultrasonic submarine detector using an electrostatic method (singing condenser) for one patent and thin quartz crystals for the other. The amount of time taken by the signal to travel to the enemy submarine and echo back to the ship on which the device was mounted was used to calculate the distance under water. In 1916, Lord Ernest Rutherford, working in the UK with his former McGill University PhD student Robert William Boyle, revealed that they were developing a quartz piezoelectric detector for submarine detection. Langevin's successful application of the use of piezoelectricity in the generation and detection of ultrasound waves was followed by further development. ^ a b Joliot, F. (1951). "Paul Langevin. 1872–1946". Obituary Notices of Fellows of the Royal Society. 7 (20): 405–426. doi:10.1098/rsbm.1951.0009. JSTOR 769027. ^ "Langevin": entry in the American Heritage Science Dictionary, 2002. ^ a b Manbachi, A.; Cobbold, R. S. C. (2011). "Development and application of piezoelectric materials for ultrasound generation and detection". Ultrasound. 19 (4): 187. doi:10.1258/ult.2011.011027. ^ Mehra, Jagdish; Rechenberg, Helmut (2001). The Historical Development of Quantum Theory. Springer Science & Business Media. p. 423. ISBN 9780387951751. ^ Paty, Michel (2012). "Relativity in France". In Glick, T. F. (ed.). The Comparative Reception of Relativity. Springer Science & Business Media. pp. 113–168. ISBN 9789400938755. Retrieved 13 December 2017. ^ Langevin, P. (1911), "The Evolution of Space and Time", Scientia, X: 31–54 (translated by J. B. Sykes, 1973 from the original French: "L'évolution de l'espace et du temps"). ^ Robert Reid (1978)  Marie Curie, pp. 44, 90. ^ Loren Graham and Jean-Michel Kantor (2009) Naming Infinity. Belknap Press. ISBN 0674032934. p. 43. ^ Françoise Giroud (Davis, Lydia trans. ), Marie Curie: A life, Holmes and Meier, 1986, ISBN 0-8419-0977-6. ^ Susan Quinn (1995) Marie Curie: A Life, Heinemann. ISBN 0-434-60503-4. ^ Arshadi, R.; Cobbold, R. S. C. (2007). "A pioneer in the development of modern ultrasound: Robert William Boyle (1883–1955)". Ultrasound in Medicine & Biology. 33: 3. doi:10.1016/j.ultrasmedbio.2006.07.030. References to the affair with Marie Curie is found in Françoise Giroud (Davis, Lydia trans. ), Marie Curie: A life, Holmes and Meier, 1986, ISBN 0-8419-0977-6, and in Quinn Susan, Marie Curie: A Life, Heinemann, 1995, ISBN 0-434-60503-4. Wolfram research biographical entry by Michel Barran. Julien Bok and Catherine Kounelis (2007). "Paul Langevin (1872–1946) – From Montmartre to the Panthéon: The Paris journey of an exceptional physicist" (PDF). Europhysics News. 38 (1).